Robin Hood Airport Doncaster Sheffield, the regional airport for the Sheffield city region, could benefit from improved links to Frankfurt, a major European aviation hub, as it makes it on to the shortlist for "start-up aid" from the Government. The Regional Air Connectivity Fund had £56m available to cover three years of financial support to create new routes, boosting connectivity, increasing trade and supporting jobs in the regions. Regional airports with fewer than five million passengers per year could bid into the fund and a new route from Doncaster Sheffield Airport (DSA) is one of 15 shortlisted routes published by the Government. 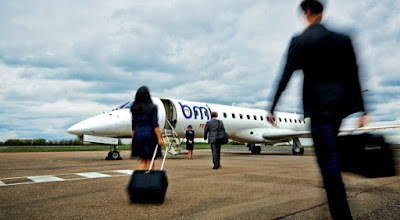 Airline, BMI regional, is hoping to secure funding to start up a weekday return to Frankfurt from DSA starting in 2016. Germany's largest commercial airport, Frankfurt is one of Europe's three largest airports and is also the biggest of the five Lufthansa hubs. It served 264 destinations in 113 countries last year making it the airport with the most international destinations in the world. Transport Secretary Patrick McLoughlin said: "Smaller airports are vital for bringing the country together and creating new international opportunities for their local areas. The shortlist we are publishing today shows the potential for smaller airports to create jobs and drive growth. Aviation is one of the UK's economic success stories and our investment ensures it is shared out across the whole country." £16m has been cut from the budget for the fund, which has been delayed due to issues over European Commission guidelines with regards to start-up aid. The promoters of the 15 routes will now need to put together detailed business plans and full economic and environmental appraisals. The mechanism is designed to reduce the risk for airlines launching new routes and lead to them becoming commercially sustainable in the medium term. The new link road currently under construction at DSA is of huge importance. The £60m FARRRS project, with £12m from the airports owners, Peel, is estimated to result in £1 billion of further investment and 14,000 jobs. Reducing all important drive times, the road will become operational in early 2016 and plans are already being finalised for a second phase that will see FARRRS extended from Bawtry Road to Hurst Lane where it will meet up with the existing airport access road. A total of nine new routes have been introduced Doncaster Sheffield Airport in the past 12 months including Bucharest, Riga, Zante and Dublin. New routes to Kosice and Lubin all start this year. Monthly passenger figures are close to breaking the 100,000 mark again. July's figure of 99,435 was the highest since 2011 and 10,000 more than the same month last year.